After Donald Trump won the majority of the rural vote in the 2016 presidential election, many newsrooms and media critics began to analyze how the media covers rural America. According to a study from the Washington Post-Kaiser Family Foundation, 60 percent of rural Americans believe the media respects them “only a little” or “not at all.” This comes at a time when overall trust in the media is steadily declining. 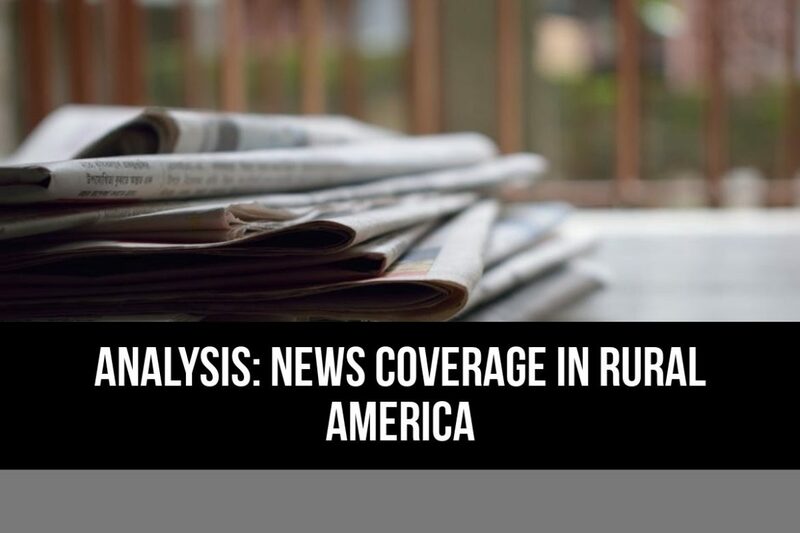 The discussion surrounding news coverage of rural America has increased as the news industry has become concentrated to the coasts and journalism jobs have become less evenly distributed throughout the country, according to a 2016 Nieman Labs report. The decline of local newspapers has been called one of the biggest crises in journalism, but some propose ways of supporting local journalism that could improve coverage. According to 2010 data from the U.S. Census Bureau, 19.3 percent of America’s population lives in rural areas — those with fewer than 2,500 people. A study from the Pew Research Center in 2012 found that people from small towns and rural areas are more likely to rely on traditional news platforms, such as TV and newspapers, whereas urban residents are more likely to consume news through “a range of digital activities,” such as websites, Twitter and blogs. Tim Marema, editor of The Daily Yonder, a multimedia news site focused on rural communities, said he believes many journalists are not aware of how rural America gets its information. The 2016 presidential election showed that the urban/rural divide in America is still growing. This divide can be categorized as a political, economic, and cultural divide between urban and rural populations in the United States. A survey by the Washington Post-Kaiser Family Foundation revealed that many rural residents believe their values differ from urban residents. Cramer said these “intense, negative feelings against people in the cities” also have to do with struggling rural communities. Some believe opportunities and money are “going to the cities” instead of rural populations. Some have analyzed whether this phenomenon led the majority of rural residents to vote for Trump in the 2016 election. The state of Illinois is one example of an urban/rural divide that has led to a stark contrast of opinions throughout the state. News coverage of rural America has often revolved around a set of negative narratives, including that rural areas are plagued by health problems, drug addiction, poverty, and a lack of resources and jobs. However, coverage of rural America, especially in major national news outlets, is limited because most news business is located on the coasts. In 2014, one in five reporting jobs were located in New York City, Washington D.C., or Los Angeles. Journalism jobs are not evenly distributed throughout the country, so fewer reporters are located in areas outside these major city markets. As media has become more digital, it has led to “greater concentration of power in the hands of a few,” according to Joshua Benton, director of Nieman Journalism Lab. Additionally, local journalism has suffered as newsroom size and advertising revenue have decreased. Many counties throughout the country have no local news outlet — otherwise known as a “news desert.” Many have suggested solutions to the gap in rural reporting. Heather Bryant, the director of Project Facet, proposed ideas of collaborations between newsrooms that could help support local journalism. Many of these ideas, such as joint reporting projects and embedding reporters, could be implemented between larger urban newsrooms and smaller rural newsrooms. Tim Marema said local press in rural areas is an untapped resource for partnerships and collaborations, but he said efforts like these are difficult to ask for in the current journalism economy. “It’s hard to say ‘develop better sources and get to know the issues more and spend time in places’ at a period where journalists are expected to do more and more with less and less,” he said. Sam Ford, a media consultant and Knight News Innovation Fellow at Columbia University’s Tow Center for Digital Journalism, has worked with rural newsrooms and studied rural communities’ engagement with media. Ford said rural newsrooms, especially those with few staff members, could consider getting community members involved by tapping into already-established networks of communication and engagement in the community. He said rural newsrooms need sustainable resources that will enable them to gather information and understand the stories and challenges in their communities. Journalists in small, local newsrooms can also be encouraged to stay in these newsrooms. Kristen Hare, a reporter at the Poynter Institute, said this could be done by providing local journalists with living wages, benefits, and mentors. Hare also suggested that small newsrooms should readily accept and embrace digital changes in the industry, and that they should collaborate with larger newsrooms. Lastly, Hare said company administration needs to be transparent about layoffs and other changes to the newsroom. Smarsh said journalists should tap into local community resources and seek sources that can tell the community’s stories. She said reporters should also avoid generalizations and stereotypes. Emily Scott is a science writer at the Carl R. Woese Institute for Genomic Biology. She is a graduate of the University of Illinois at Urbana-Champaign, where she studied journalism and agricultural communications. She is currently pursuing a master’s degree in journalism at the University of Illinois at Urbana-Champaign.